Downloads | Electric Comic Book. King Khan Releases New EP for Free. I was originally going to post about the new Black Keys single that came out today, “Lonely Boy,” but I figure: we haven’t heard from King Khan in an even longer time, so this is more important. Working with the Scion A/V series, this is King Khan’s first release since 2009’s Invisible Girl, with BBQ Show. Click on the link here for the nine-song EP, The King Khan Experience, and enjoy the kind of psychedelic punk that only King Khan can provide. Yeah, you have to sign up with the Scion people, so expect some obnoxious e-mails coming your way from that whole thing, but seriously, this is worth it. (alright, fine: here’s the link to watch the video to Black Keys’ “Lonely Boy.” Sheesh. Cry babies). Remixers and Nerds United: Multi-Track Site! Just a quick heads up, but this is impossibly cool. For those amateur remixers and DJs who wish they had single tracks from a song’s multitrack final mix, or alternate takes or studio takes or whatever, this is the site for you. Studio Multitracks hosts YouTube versions of isolated tracks for your listening (and potentially mixing) pleasure. Keep in mind, these tracks are in real time, so they match the actual runtime of the original finished track, so don’t expect something neatly edited and compressed. UPDATE 6:45pm: After fooling around with the site a little while longer, I’m actually going to have to say this funky demo version of “Won’t Get Fooled Again” is pretty great. I’ve heard it before, and if you’re as big a fan of the Who as you SHOULD be to order and listen to Pete Townshend’s Lifehouse Chronicles, you will find this absolute gem. Posted in Classic Rock, Downloads, Whisky Tango Foxtrot. On Tuesday, the biggest news from the Beatles in quite some time arrived in the Beatles, the very reason why bands do “something different” by the time they reach their third album, joining the digital revolution, a decade after massive proliferation of the .mp3 file. Aside from the amazing resistance to going to digital and how this is a positive for the Beatles from a business standpoint, there really is no story to tell. Christmas came early for Steve Jobs, and that’s that. 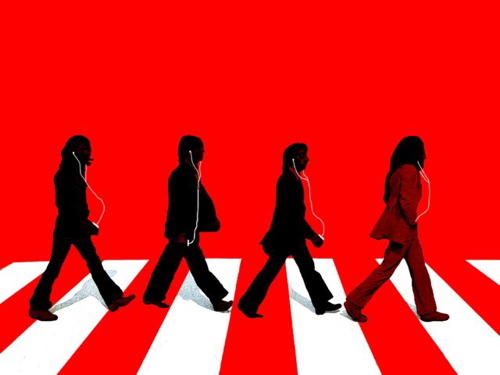 All of this became possible through the mediation and revision of the 1991 agreement between Apple Corps and Apple Inc. regarding Apple Computer’s presence in the music industry, which caused a trademark infringement suit on the Beatles behalf after the launch of iTunes. This was resolved three years ago when the agreement was revised to state that Apple Inc. cannot compete in the music industry through the sale of physical format items (CDs, LPs). Now, the most relevant hold-out to the tentacles of Jobs is Frank Zappa. Posted in Downloads, Whisky Tango Foxtrot. Yoko: “Don’t Hold Your Breath” on Beatles Downloads. Yoko Ono Would Like to Remind You Her Eyes are Up Here, Mister. The original disagreement goes back to the founding of Apple Computers as a company, where in an effort to avoid confusion between the two companies, the Beatles’ Apple Corps. demanded that Apple may never become active in the music industry. However, after the release of the iPod and MP3 software iTunes, the Beatles felt these products were a violation of their original agreement. On the news I heard today at the Love Me Nots will be playing a festival with Nada Surf, Brian Jonestown Massacre, and Iggy and the Stooges (at Le Printemps de Bourges Fest in France, April 16th), I immediately thought how I would kill to hear that amazing concert! With any luck, it’ll wind up on those bands respective websites/MySpace pages. And if we’re really lucky, it’ll be released officially on CD. But if this is not the case, we could always hope a fan with a lot of forethought will bootleg the whole thing for us fans, and put it up on one of the following websites. Wolfgang’s Vault – A terrific source for top-quality recordings from a variety of major acts. Some concerts are available to download for a price, but all posted concerts and streaming for free. Additionally, Wolfgang covers the bases of the live concert experience by also providing a slew of informational links and memorabilia on every page. Though, it must be said: while the site focuses mainly on major acts, some have virtually no material available. Archive.org – For everyone else not big enough to make it to the mainstage, there’s Archive.org. The drawback is that you have to really know what and who you’re looking for, as only so many groups agree to have their music featured on the archive. And, as the assumption is that bootleg concerts are primarily a jam band’s enterprise, you have to wade through a lot of regional acts that decide to have their music hosted here. However, there are some really choice acts who are featured on Archive.org, including The Black Angels, Camper Van Beethoven, Alejandro Escovedo, and the Dirtbombs. (Personal recommendation: The Black Angels on June 2nd, 2007 — notable for their wicked cool cover of “I Wanna be Your Dog,” that exchanges the Stooges’ punk fury for a druggy, sludgey psych approach). Bootleg Browser – I can’t really recommend this one, because a lot of the links on this page are dead, and a lot of the audio is of questionable quality. But which ones are still alive can yield some decent finds. I include this one for the sake of just having another option, and all of these are free to download. Still, download at your own risk here. White Stripes to Release Earliest Recordings. According to British music mag-site NME.com, the White Stripes will be releasing demos of some of their earliest tracks, including alternate takes of the single “Let’s Shake Hands” and B-Side “Look Me Over Closely.” The music will be posted at the website of Jack’s own record label, Third Man Records, and is being included in a special offer to members of “The Vault,” the label’s subscription program. Also included in the package is a vinyl copy of a live London performance of the Raconteurs and a screen print poster of Jack’s latest project, The Dead Weather. A subscription to the Vault is priced at $7 a month, and promises regular giveaways to members in addition to other exclusive content. Registration ends October 22nd.